Rescue crews and medics from North Texas are headed to the coast in advance of Hurricane Harvey as Navy jets and personnel from two bases are headed to the Naval Air Station Joint Reserve Base Fort Worth for safekeeping. The Fort Worth Fire Department is sending 14 firefighters and at least one rescue boat. They’ll part of Texas Task Force One and will stage in College Station Thursday night awaiting orders to deploy to flooding, said task force spokesman Jeff Saunders. Meanwhile, a medical bus and firefighters from the Flower Mound Fire Department are also headed to the coast. The Naval Air Station Joint Reserve Joint Reserve Base in Fort Worth is serving as a safe haven for military aircraft based in Florida trying to avoid Hurricane Harvey. They’ll stage in San Antonio. The bus, capable of treating a large number of injured people, is part of the North Texas Trauma Regional Advisory Board. Other buses, from Cedar Hill, Fort Worth Medstar and Frisco, are on standby, officials said. At Naval Air Station Joint Reserve Base Fort Worth, they are prepared to shelter jets and personnel from NAS Corpus Christi and NAS Kingsville. Both bases are being fully evacuated, said NAS JRB spokeswoman Karin Krause. Krause said exact numbers are unclear, but the Fort Worth base is prepared to accept 100 training jets and has cots for 500 personnel. She also said those evacuated will try to get hotel rooms. 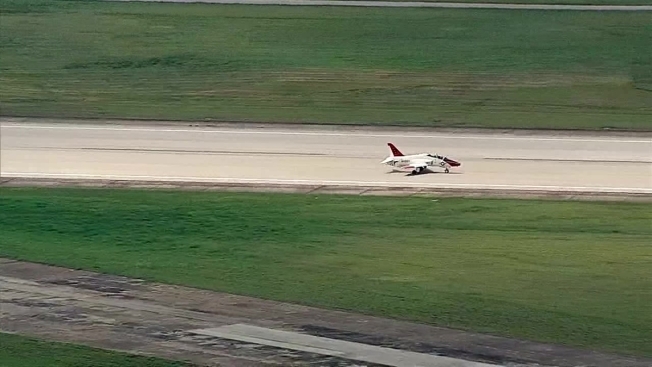 As of Thursday afternoon, about 35 T-45 jets had arrived from NAS Kingsville. "We will take this scenario one day at a time here as it plays it," said Capt. Jonathan Townsend, commander of NAS Fort Worth JRB. "We are uniquely postured to handle the situation. we're glad to help out."